Melt the white chocolate over a double boiler or very carefully in heavy pot. Add peanut butter and blend until smooth. Pour white chocolate/peanut butter mixture onto an oiled cookie sheet and spread out a bit. Let set for a bit. While you are doing this start to melt the bit of dark chocolate in a separate pot. 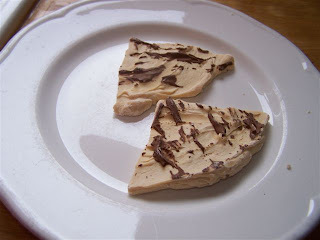 Drizzle the melted dark chocolate over the white chocolate/peanut butter mixture in small lines. You are making this look like tiger stripes. Cool in fridge. Break into chunks. Eat, share or give as gifts. **We are calling it white chocolate here because then people know what we are talking about but in my house we would say that with much scorn in our voices - how can it be called chocolate when it isn't even chocolate??? I like to refer to it as white confection...it certainly has its place and it is delightful in this recipe...but chocolate it is Not!! tempted tho, I tell ya, this is GOOD STUFF!!! I love this line: "You are making this look like tiger stripes." For some reason it totally cracks me up. Funnily enough, I too am making some food gifts: truffles. Sadly I added too much cayenne to one batch, and had to make some more melted chocolate to dilute it a bit. Drats. Now what am I to do with all this leftover melted chocolate? Shelia - I too find leftover chocolate to be such a problem. I mean, one can only have so much hot chocolate before it becomes tiresome, heh? ;-) Are you going to be posting about your truffles (and maybe the recipe) on your blog?